Tori Amos once said “there’s room for everybody on the planet to be creative and conscious if you are your own person. If you’re trying to be like somebody else, then there isn’t.” If that’s the case, the planet belongs to Jorge Midence. Midence, a Canadian Milliner based out of Toronto, has taken the hat making business by storm. 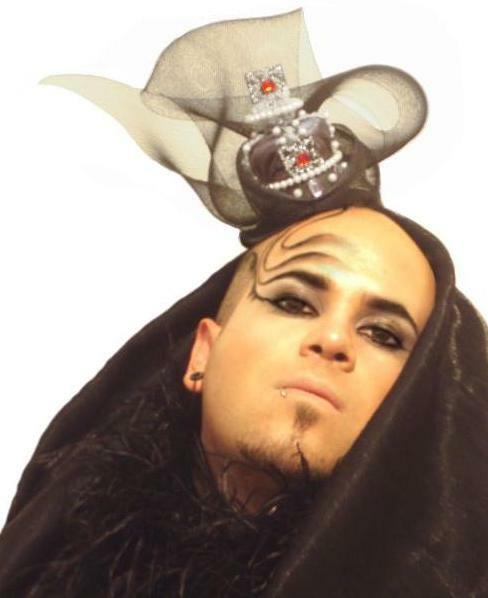 His peerless headpieces have gained recognition across North America, and his ingenious style is a force to be reckoned with. CB- How long have you been in the millinery business? JM- [It’s been] a life long journey of self-expression, that only recently slanted towards Millinery. I have been creating hats for 2 years now and have registered my company, Midence Oliu Millinery, [in] November 2009. CB- There are a lot of designers out there whose medium of choice is clothing; what is it about the millinery business that attracted you? JM- I saw a video of the late Isabella Blow running in an outrageous outfit. I didn’t fully understand what I was watching, but instantly knew that what I saw is how I want to be and feel: fabulous! It was more her discovering me than the other way around. The idea of jumping into a 4 year fashion program did not appeal to me, I wanted to be fierce NOW, my time is NOW. Luckily, George Brown is the only school in Canada that offers a Millinery Certificate. CB- Some say the fashion industry is cutthroat. How do you keep your head above water when it comes to keeping your designs relevant? JM- It’s such a fine line, we often forget that fashion is a business. The Fashion Machine has a tendency to chew you up and break you down in order for you to be understood by the masses. However, the second you change because of someone’s critique or to fit someone’s standards, you have lost your vision; just know how and when to compromise. On keeping my designs relevant, we have to remember who [our] competition is, what the international market is producing. I design to make myself feel FIERCE; either you get it or you don’t. CB- Fashion is an art form as it allows designers to express their creativity. However nowadays, it seems as though everyone has a clothing line. How do you classify fashion as an art and fashion as a business? JM- Fashion is a tragic tango between art and commerce. CB- Well said, fashion is sort of like a tango between art and commerce. Being that your designs are so artistic, do you consider yourself an artist? JM- To be honest, I actually wish I was MORE of an artist. CB- Where does your creativity stem from when it comes to conceptualizing your designs? JM- Necessity is the mother of all invention. A lot has to do with working within the parameters of any given commission. The material dictates the design. Millinery is all hands on, I shape it, cut it, burn it and place it on my head and just stare in the mirror. I think I spend more time strutting and posing then actually designing. CB- Strutting and posing… Nothing wrong with that! You have to be able to “work” your own designs! What would you say is your greatest accomplishment as a designer? JM- The greatest accomplishment of any human being should be the ability to work in something you are passionate about, which is an immense luxury. CB- Who in your mind, aside from yourself of course, is the greatest milliner of all time? JM- In modern times there are 2 legendary milliners who have revived the hat movement. They are Stephen Jones and Philip Treacy. CB- I read the following quote somewhere: “For when a woman puts on a hat, a transformation oft takes place: self-confidence and self-respect show in the lady’s face. She accents her femininity; she stands tall, with shoulders back…” Would you say that your works provide the same transformation, and what would that transformation be? JM- Hats are power. You don’t have to be confident to wear one of my hats, I think you gain confidence because of [them]. CB- Hats are power indeed! What can we expect from you in 2011? JM- Opening my showroom here in Toronto and launching my label on an international scale. I’m also collaborating with an online retailer to launch my ready-to-wear label Mizz by Oliu in Spring 2011. CB- We’ll be keeping an eye out for that! How can interested buyers get a hold of your headpieces? Keep an eye out, folks: Midence Oliu Millinery is coming to a runway near you! Chief Creative Director & Founder at Preface Agency - Gap thooted gem from the motherland,style conoisseur, blogger,better half of another ,good food eater, bargain shopper.